In Mandalay, People In Need built a kindergarten for children of families affected with HIV/AIDS. Myanmar has the second highest number of people living with HIV in South-East Asia. Despite a general decline in new infections in Asia the epidemic is still on the rise in Myanmar which is largely due to a low financial investment in public health and insufficient funding of effective primary HIV prevention. Children in HIV-affected households suffer most as parents struggle to find a job and to earn sufficient income because of illness, stigma and discrimination. Frequently, parents cannot provide for school education and for the safe upbringing of the children. PIN joined with the Good Shepherd Sisters to help the HIV-affected children in Mandalay. Starting 2016, People in Need leased a plot of land from the Methodist Theological College in the center of Mandalay. Here we built a new one-storey kindergarten with an outside playground. The nursery exclusively cares for children affected with HIV and children of HIV-affected families. It is run by the Good Shepherd Sisters, Mandalay and PIN takes care of all expenses including the lease of the land. PIN provides a free daily lunch and essential medical care. 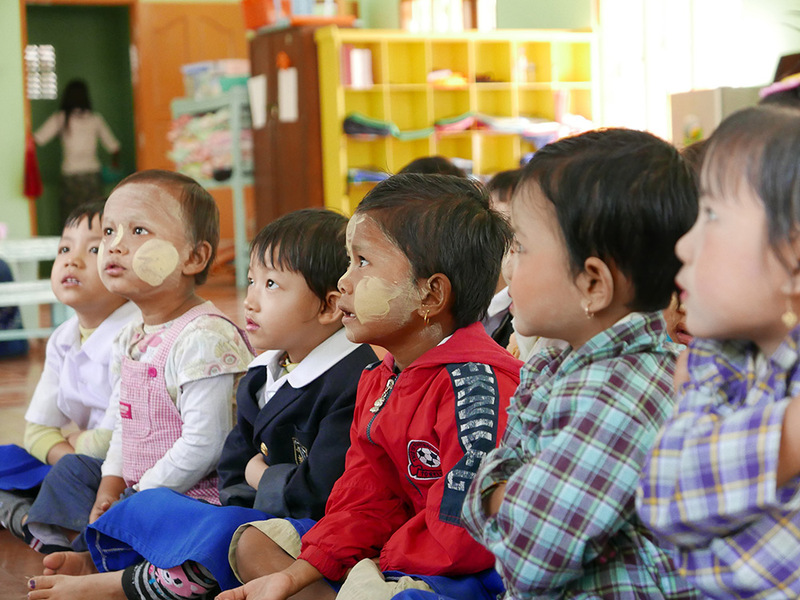 At the beginning of the Myanmar schoolyear in June 2016 we opened the nursery and welcomed 25 children. The children are between 3 and 6 years old and live widely scattered across Mandalay Township which requires us to collect the children by car in the morning and drive them back home in the afternoon. To provide intensive care and support to the children we employ three full-time nursery teachers and one cook and helper. The teachers are assisted by the Sister in charge of the kindergarten. Our teachers follow the innovative child-centered approach to education developed by M. Montessori. In addition, they have obtained a teachers’ license from the Myanmar government. Mondays to Fridays, the first group of children arrives by car at around nine o’clock followed by a second group some 30 minutes later. Until all children have arrived they play outside on the playground. Then then they start the day in the nursery with an opening song. After drawing and painting they sit down for a short meditation session. The rest of the morning they learn English words, sing songs and nursery rhymes, practice writing, play music and dance. After the free lunch for all they will rest. In the afternoon the children play games inside the house and outside before they are driven home. To complement the education of the children our nursery teachers invite the parents for regular educational meetings. They visit the children’s homes to check on the well-being of the children. In the kindergarten the teachers celebrate the children’s birthdays and celebrate the many official holidays and religious feast days of Buddhists, Hindus, Muslims and Christians. Every year at Christmas the children prepare an entertaining and enjoyable program of songs and dance for a Christmas Celebration which they present to their parents who happily join the Christmas party in the kindergarten. At the end of each school year they also perform at a Graduation Ceremony which is attended by their proud parents. With the onset of the dry season in October 2016 we had to put up a sunroof over the playground of Myinttamon Nursery. The sun had gotten too hot for the children to play outside without a shade.